Regardless of what form the story will take, the question remains: where to begin? Not with an encyclopaedic mastery of the facts, but with some detail that will catalyse the creative process: an irritant, grit in the shell, an indecipherable image or an indigestible notion. The epitaph to Jim Crace’s The Gift of Stones is an excerpt from an archaeologist’s memoir: the discovery of ‘the skeletal lower arm of a child’ prompts its excavators to speculate ‘in the darkness of our tents, inventing reasons why the arm was there, and what the fate had been of that child’s other bones’. The novel can be read as an extended exercise in just such speculation. Those kinds of moments – jumping-off points for the imagination – are impossible to force. (Or if it is possible to force them, I would like someone to tell me how!) A few years ago, on a trip to Ukraine and Scandinavia, I visited Klekkende Høj, a collective burial mound on the Danish island of Møn, dating back to the third millennium BC. I will admit, now, that I was hoping for such a moment, an epiphany: a gift, perhaps, from the entombed souls of the ancients, a flash of atavistic insight that would illuminate their world for me, to smudge the hard academic pencil-line that separates the known from the unknowable. As it happened, I did have an epiphany, of sorts. But it had nothing to do with my story, or any insight into the world of the ancients. 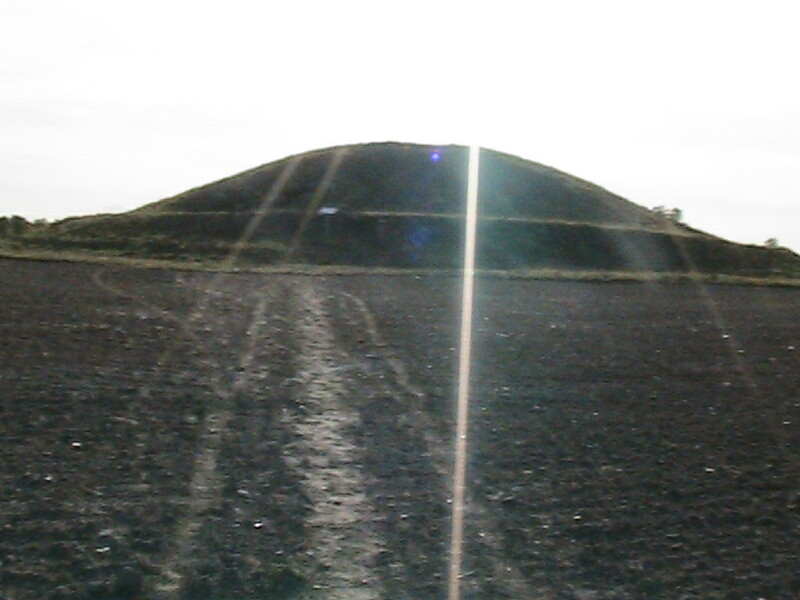 The photos I took that day, indifferently shot with a cheap camera and obscured by the glare of the late afternoon sun, convey little of the thrill of sighting the burial mound, high on the hillside, or of the solemnity of the great stone slabs that form its entrance. Crouching, I could just about make my way along the passage into increasing darkness. I waited. And experienced no moment of insight, no glimpse back across the centuries. Feeling my way through the tunnel in hoodie, jeans and sneakers, I was no more or less than a modern man, trying not to scrape my head on the ceiling. I’m willing to admit to this moment of embarrassing naiveté and predictable failure only because this month’s travels have been so different. Certain aspects of what I want to achieve, and the outlines of a path to arrive there, have started to become visible. That’s horribly vague, isn’t it? I can’t help it; I’m too superstitious, too instinctively private. Perhaps a writer more in tune with the Zeitgeist, more willing to share the machinations of their process in the medium of a blog post, would be able to say more. These posts have already travelled to the far edge of my comfort zone for ‘sharing’ – I can’t be more specific. All I can say is that after these weeks of journeying, note-taking, reading, taking photos and reflecting, I feel like I know my story’s direction of travel. That’s certainly more than I could say for that last trip, the one that included the visit to Klekkende Høj. Is there some lesson to be learned from this contrast? A moral of the story? I can offer little but the obvious: patience, being open to the possibilities of the moment, and – perhaps this is the influence of the Germans among whom I have been travelling – the Protestant virtue of hard work. Dull stuff! It may be – as is so often the case – the failure that’s more instructive, though I didn’t realise it at the time. It’s true that my visit to Klekkende Høj did not afford me the short-cut to a time traveller’s insight for which I had hoped. But as I mentioned, I did have another kind of epiphany. Being inside that tomb was an extraordinary experience. I can bring it to mind most effectively by recalling what is missing from the photos I took within the tomb. Even when I took them – one with a flash that eradicated the very enclosing darkness that was the essence of the moment, the other with the flash turned off, delivering only a rectangle of barely-differentiated black – I knew they would fail in their purpose, a physical record of that experience. I can only describe it in negatives, such as to say that, for me, time appeared to be suspended, or at least irrelevant; or that, despite being entirely alone, I felt neither presence nor solitude. The memory of that feeling stayed with me for some time. It was not until several years later that I found an intellectual framework in which to situate the experience. In Being Singular Plural, the French philosopher Jean-Luc Nancy interrogates the primary qualities of existence, suggesting that its foundational nature is not individual, but shared, or communal; that Mitsein (being-with) is ‘essential to the constitution of Dasein’ (being-there), but that this centrality is obscured or underdeveloped in Heidegger’s own work, which, he suggests, requires a ‘recomposition in which Mitsein would be actually coessential and originary’. Writing two years later, the German philosopher Peter Sloterdijk takes a similar tack, conceiving his Spheres trilogy as companion and continuation to Being and Time, and, in particular, a corrective to what Sloterdijk sees as its neglect of questions relating to being-together in the world, an ‘ecstatic entwinement of the subject in the shared interior.’ It is difficult to describe in words that which precedes or follows language: ‘Once the point of being-inside has been reached, all language games of observing and facing must indeed come to an end.’ Perhaps this is why religious communion can only be evoked obliquely in the anti-discourse of mysticism; though it’s perhaps significant that Sloterdijk also insists on the primacy of song over speech. It’s in the harmony of the singing voices, rather than the meaning of the sung words, that the communal nature of the song resides. To subvert Wittgenstein’s proposition: whereof one cannot speak, therefore one must sing. Silence, or song. Of course, the state of pre- or post-subjectivity to which Sloterdijk refers is a far more profound and extraordinary state than stumbling into a cave. But even in the simple, literal case of ‘being-inside’, Klekkende Høj was a moment about which speech falters, and images misrepresent. I sought to cast my mind back to another time, but instead I found myself in a profound darkness, in which, for a moment – suddenly and unexpectedly – I forgot to be myself. However irrelevant to the project of prehistorical fiction, this accidental discovery, the meaning of which has so far eluded all my attempts to grasp it, is just the kind of indigestible notion that sticks in the craw of the mind and catalyses the creative process. I still don’t know what, if anything, it will provoke me to write. All I know, really, is that I did not find what I set out to find – and I’m glad of that.